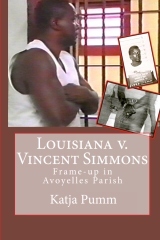 There is an interesting discussion with Judge Mark Jeansonne of Avoyelles Parish on the Innocent in Prison Project International forum about Vincent Simmons’ case and the book Louisiana v. Vincent Simmons: Frame-up in Avoyelles Parish. Does anyone want to join in and vote on whether or not you want Simmons to be granted an evidentiary hearing or re-trial? Or do you agree with Judge Jeansonne who chose to vote for “Keep Vincent Simmons in prison”? Judge Mark Jeansonne’s re-election campaign of 2008 received contributions in excess of the contribution limit from family Knoll. See the Louisiana Board of Ethics’ order here. “Eddie” Knoll and Jeannette Theriot Knoll (the parents of Edward Knoll, Jr., Edmond Knoll, and Triston Knoll) prosecuted Vincent Simmons in 1977.